Firefly, 275 George St (7 minute walk) If you’re planning a relaxed business lunch over a beer or wine, then Firefly is your answer. Grab a seat in the fresh air and choose from a sizeable menu of delicious pizzas and salads. Public, 400 George St (4 minute walk) A beautiful grazing menu, fresh produce and an extensive wine and cocktail list make Public a top choice for a long lunch or a romantic dinner. Its share plates are also great for Friday night drinks. GOMA, Stanley Pl (11 minute walk) Take a stroll over the Kurilpa bridge and spend the morning taking in modern art at GOMA, then indulge in beautiful river views over coffee and tasty Modern Australian lunch options. Queens Plaza: Queen St (5 minute drive) If you love high-end labels make a beeline to QueensPlaza to find global icons like Chanel and Aussie favourites such as Zimmermann. Queen Street Mall: Queen St (7 minute drive) Explore over 700 retailers throughout Brisbane’s central shopping precinct, with everything from fashion to tech products. The Collective Markets: South Bank (8 minute drive) These artisan markets come alive on Fridays, Saturdays and Sundays and offer bespoke homewares, fashion and art. 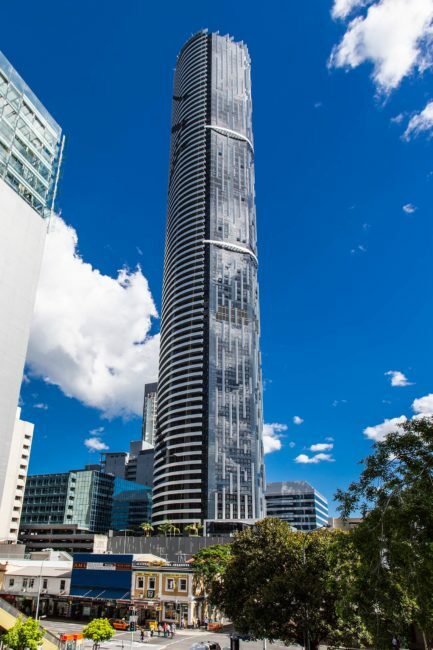 Journey: A 30-45 minute trip from Brisbane Airport to Meriton Suites Herschel Street. Journey: A 25-30 minute trip from Brisbane Airport to Central Station, then a 10 minute walk to Meriton Suites Herschel Street.